10 minute helicopter tour of Chicago, departing from the Chicago Vertiport located at 1339 S. Wood Street, Chicago, Illinois, 60608. 20 minute helicopter tour of Chicago, departing from the Chicago Vertiport located at 1339 S. Wood Street, Chicago, Illinois, 60608. For a limited time only, bring four friends or family members for a helicopter tour of downtown Chicago. Costs just $99.00/person. 15 minute helicopter tour of Chicago, departing from the Chicago Vertiport located at 1339 S. Wood Street, Chicago, Illinois, 60608. 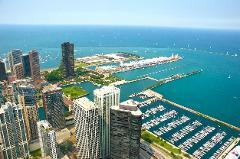 15 minute helicopter tour of Chicago, for two passengers, departing from Vertiport Chicago. 30 minute helicopter tour of Chicago, departing from the Chicago Vertiport which is located at 1339 S. Wood Street, Chicago, Illinois, 60638-Near Downtown Chicago. Private 30 minute helicopter tour of Chicago, for two passengers, departing from the Chicago Vertiport which is located at 1339 S. Wood Street, Chicago, Illinois, 60608 near downtown Chicago.